To meet an insatiable Russian demand, inhabitants of Ustyuzhna toil away for hours every day to gather cranberries. Artists, teachers, software engineers and pensioners are all united by necessity, as well as a passion for cranberry picking. For centuries, the cranberry was known as the “Russian berry” in Europe. The berry, which grows everywhere in Russia, has been traditionally considered a natural antibiotic and antiscorbutic. Mors, as cranberry juice is known in Russia, is one of the most popular beverages in the country. Russia's north is home to quite a rare variety of this berry, the small-fruited cranberry. For residents of some parts of the country cranberry is now also a good source of income. 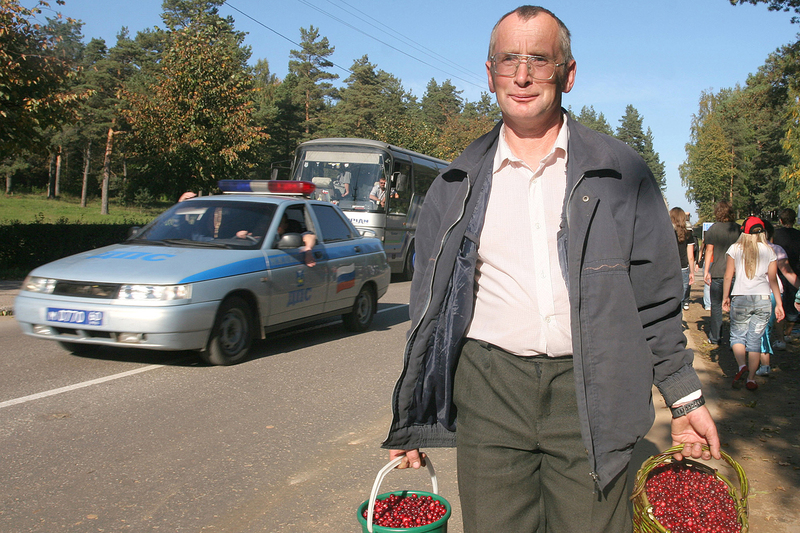 Russky Reporter takes an in-depth look at the lives of cranberry pickers in Russia’s north. The Vologda Region (north of Moscow and east of St. Petersburg) is not rich in gold or oil, but a kilogram of cranberry gathered here fetches a price from 60 rubles [slightly under $1 at the current exchange rate] onwards. Residents of the region's Ustyuzhna District have for several years been making a living out of gathering cranberries. Artists, teachers, software engineers and pensioners are all united by necessity, as well as a passion for cranberry picking. Our swamp buggy is going along a straight track running through the endless moss. There are seven men inside the vehicle, with sacks, similar to those used by cash-in-transit guards, thrown into the trailer in the back. The men are all hanging out of the buggy, scanning the passing ground in search of cranberries. They can make 60 rubles per kilogram at a buying station. We left Ustyuzhna when the morning sky was still full of stars. After two hours of a rocky drive in a UAZ jeep, we have now been roaming around the marshes for an hour in the swamp buggy. In order to find cranberries, one has to get up to one's ears into the swamp. Volodya, a tall, gray-haired man, is the foreman. He is smoking a pipe, while looking out of the window. The jeep that brought us here is his, as is the buggy on which we are now looking for berries. Half of the day is gone, and we still haven’t spotted cranberries. The cranberry season started on Sep. 7, but they say this year is not very good for the berry. Volodya suddenly spots a place full of cranberries. The men grab their buckets and sacks and instantly disappear into the dull marshes nearby. They are walking ankle-deep in wet moss. You can’t remain in one spot for too long, as it can become as dangerous as quicksand. There aren’t many jobs in the Ustyuzhna District, unless a resident wants to work in a local prison, either as a guard or as an inmate! But there are numerous buying stations for berries and mushrooms. The stations compete with each other to buy the best of the lot. Berries in the swamps grow free of cost and one does not need a license for picking them, while berry juices, jams and frozen berries are in great demand. Berries are taken to the nearest town, then to the district center, and then to Moscow. On the way, they turn into drinks, pie fillings, and quite decent money. While local stations buy berries from pickers at 60 to 100 rubles per kilogram, a Moscow-based online store sells them for 300 rubles. Foreman Volodya is climbing on top of the buggy. From there he can see where the others are. Volodya says people from all walks of life have joined him in the past. “One was a former civil servant. He is a huge man with red cheeks, and is as strong as a bull,” he says, adding that the former bureaucrat was quite good at berry picking. Volodya also talks about a policewoman, who joined them on weekends. The berry season lasts about five months, with blueberry followed by lingonberry, followed by cloudberry, and finally cranberry. The biggest profits come from cranberries. During the season, pickers work without days off. They leave at seven in the morning and get back at eight in the evening, spending up to six hours on the journey there and back. The swamp covered in moss is lush and soft. Tight red balls of cranberry are scattered all over it, like blood-filled bedbugs clinging to a body. You place a bucket under the berries and scoop them into it. The prominent forehead of an intellectual-looking Oleg is furrowed with tension, both emotional and physical. He throws his first sack of the day into the trailer attached to the buggy and straightens his back. Oleg is a zoologist by education but a translator, teacher, historian and polyglot by trade. He lives with his friends in a house in a village and teaches history and foreign languages to local children. In his free time he translates a book about King Charles XII from Swedish. Oleg is slightly embarrassed to be seen in this setting. “It is an experiment, picking berries. Translations are paid for in batches, it takes time… In the meantime, one has to earn somehow,” he says. “How did you end up in Vologda Region,” I ask him. Ustyuzhna is an old, beautiful, and God-forsaken town. It is largely populated by people released from the local prison, which is located in the heart of the town. “Is this Europe,” I ask. “Sure,” he says with a laugh. Volodya's house in Ustyuzhna is towering over nearby buildings like a fortress above the banks of the Mologa River. There are birch trees growing outside the tall wooden gate. Laced smokestack is glittering in the sun, there is a well-fed cat, a Russian Blue, warming itself atop a solid fence. Outside the windows, a quiet river is winding behind a hill. A truly Russian landscape! In the village of Timofeyevskoye outside Ustyuzhna, we enter a big room in a wooden house. It has a high ceiling and is as spacious as a hangar. There are stacks of old issues of the Foreign Literature magazine, authentic furniture, shelves full of books, paintings on the walls, and handmade toys. The house belongs to artists, the parents of berry picker Afonya. A Dalmatian is sleeping on the armchair, while Afonya and Oleg are sitting by the fire. “Why are there so many cranberries? Do they propagate from seeds,” I ask Oleg. He may not be a botanist but he is a polyglot after all. I tease him. “There are so many cranberries, just so you can make a living out of picking them,” I suggest. “In a way,” he says, and we both laugh. The manager of one of the local buying stations tells me about an incident from the 1990s. She was in dire need of money, and local residents took her with them to pick cranberries. She managed to gather 25 kilograms, while the two locals, who brought her to the swamp, just managed 10 kilos between them. There is a saying that berries are almost magical - they are found by those who need them the most. At the end of the day, foreman Volodya takes out a ledger. He calculates how much each member of his team gathered and how much money they will be paid. Yura has collected 72.9 kg, earning 4,300 rubles. Afonya has brought 40.5 kg and will get 2,400 rubles. If Afonya worked in the public sector, his monthly pay would probably not be much higher. Everybody is tense while the foreman is counting the kilograms and paying the money. They put their money in their pockets and then relax. Work at the sawmill is so hard because there is very little machinery there and workers have to carry everything themselves. Valya's father works there. Today Valya has picked 90 kg of cranberry and will get 5,500 rubles for it. A one-bedroom flat in Ustyuzhna costs about 1.5 million rubles. Which means that if he works hard, Valya can save enough money to buy himself a flat after three berry-picking seasons.